Having a hard time focusing lately? You’re not alone. Research shows interruptions occur about every 12 minutes in the workplace, and every three minutes in university settings. In an age of constant digital interruptions, it is no wonder you’re having trouble ignoring distractions. 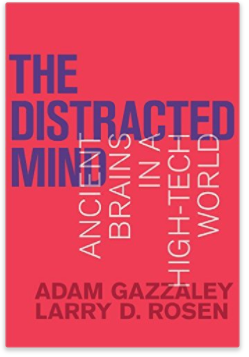 In their book, The Distracted Mind: Ancient Brains in a High-Tech World, Dr. Adam Gazzaley, a neuroscientist, and Dr. Larry Rosen, a psychologist, explain how our ability to pay attention works and what we can do to stay focused. It turns out, attention isn’t as simple as it seems. In fact, paying attention involves two separate functions: “enhancement” (our ability to focus on things that matter) and “suppression” (our ability to ignore the things that don’t). Interestingly, enhancement and suppression are not opposites, they are distinct processes in the brain. If either of these brain processes is impaired, we lose focus. For example: we struggle with attention when we are tired, drunk, and, most notably, as we age. Older adults are biologically more distractible than young adults. Personal anecdotes and scientific evidence demonstrate that our attentional capacity peaks near age twenty and diminishes over time. Gazzaley discovered that age-related declines are caused by a deficit in the suppression (ignoring) process. The attentional decline we experience as we age has more to do with our inability to filter out distractions, not our lack of concentration. If you think it’s hard to pay attention now, just wait until you age a few more years. Have you ever noticed someone squinting their eyes in an attempt to recall something? Turns out closing your eyes to remember may actually work. Why this quirky technique is effective tells us something important about how the brain filters information. When your eyes are closed, your brain isn’t working as hard to filter out visual information. Instead of struggling to ignore everything in your field of view, your brain can devote more attention towards scanning your memory. Gazzaley conducted an experiment to see what type of visual information is the most distracting. He and his team asked volunteers to remember details while looking at one of three visual scenes: a plain grey screen, a busy picture, or with their eyes closed. This experiment, along with others, provides evidence that cluttered and disorganized environments are more distracting than organized ones. Spaces filled with visual distractions force our brains to work harder to filter out superfluous information. When facing a pending deadline that you desperately need to focus on, clearing your desk and workspace to make it like the grey screen can increase your focus. Try clearing your virtual desktop of clutter as well. Limit yourself to one monitor, one browser tab or window and one computer program or app at a time. Gazzaley and Rosen say some activities may boost cognition and attention by stimulating the brain’s ability to strengthen and reorganize existing neural connections, a process called neuroplasticity. Activities that may boost cognition include physical exercise, meditation and spending time in nature. Recent research also finds that some cognitive exercises may also help. Although there are many brain training programs, some of which have over-promised and under-delivered, some scientists believe a new crop of clinically validated programs may soon come online. For Gazzaley and Rosen, adaptivity is key. Just as athletes must adjust their exercise routines as they grow stronger; cognitive exercise programs must also adjust to how well, or how poorly, the participant is doing in the task. Personalized adjustments make the training more successful. New research shows the promising effects of cognitive exercise programs in older adults and healthy populations. Gazzaley and Rosen caution that while the research is encouraging, more clinical trials are needed to prove medical benefits. However, many in the industry are hopeful doctors will one day prescribe game-like cognitive exercises as part of a healthy brain training regimen. In the meantime, certain currently available video game titles may actually be good for brain health and improve cognition. A 2003 study of video-game play linked better cognition and higher scores on attention and memory tests in gamers vs non-gamers. But not all video games are created equal. Non-gamers who played the first person shooter game, Medal of Honor, one hour per day for 10 days showed improvements in cognition, while the ones who played Tetris did not. Video games may give you a boost, but not every off-the-shelf game will do the trick. The difference between the games that work and the ones that don’t gives us information into how the brain changes in response to its environment. In 2013, Gazzaley verified that a custom-designed cognitive video game, NeuroRacer, improves cognition in older adults. Dr. Gazzaley’s research led to a proprietary technology platform to measure and improve certain executive functions. In the future, cognitive video games will be like “Neuro Cross Fit Training” as Gazzaley calls it. They will combine elements of physical activity, meditation, and cognitive exercise, rolled into one game. In the meantime, we can do our part to keep our attentional focus sharp by first reducing distractions to improve our suppression capabilities, and then beefing-up the brain’s enhancement functions through activities like exercise, meditation, outdoor time, and immersive video games. We can boost our ability to concentrate by doing just one thing well at a time. Researchers say our ability to pay attention is equal parts focusing and ignoring. Irrelevant information bogs down our ability to suppress distraction, especially as we age. To increase our ability to focus, researchers suggest both boosting our ability to concentrate as well as reducing distraction. Use one screen, one browser window, and one computer program at a time. Keep your physical and virtual desktop tidy. Exercise, meditation, and spending time in nature may help boost cognitive control. Some cognitive exercises and immersive action video games also seem to improve our ability to focus. Note: This post was co-authored by Nir Eyal and Chelsea Robertson, PhD and was originally published on NirandFar.com.